Get up and go! Whether as a replacement for your morning coffee, or to combat the afternoon slump, Fizz Sticks are a quick dissolving, tasty way to create a refreshing bubbly drink that will put the bounce back in your step. Fizz Sticks feature essential B vitamins, which contribute to normal energy metabolism, and pantothenic acid, which contributes to a reduction of tiredness and fatigue. A healthy supplement drink - only 13 calories and less than 2 grams of sugar per stick pack. Contains antioxidants and botanical blend of green tea, guarana and ginseng, combined with B vitamins and chromium. To find out more about Fizz Sticks or any other Arbonne products, click the order now button above and complete the product enquiry form above. Fizz Sticks are my go to product. I simply add them to a glass of filtered water and give them a stir and I know I’ve got about four hours of energy under my belt, perfect for a mid-afternoon pick-me-up! Simply empty 1 fizz stick pack to 400 ml of water and stir. Do not pour into a full water bottle as fizzing could cause an overflow. Once completely dissolved, add ice or refrigerate for a refreshing drink. Use these natural energy supplements occasionally to complement a healthy, balanced diet. Arbonne's vegan and gluten-free certified products are developed with premium blends of vitamins, minerals, botanicals, antioxidants, enzymes, prebiotics, and probiotics for maximum product effectiveness. 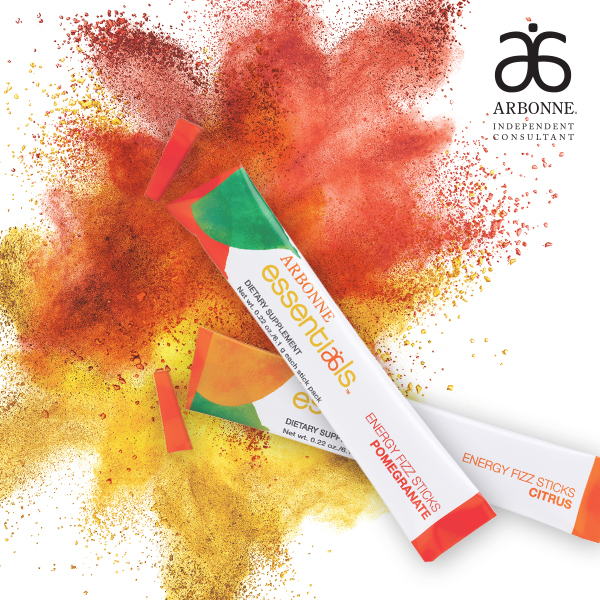 To see more or browse more of the Arbonne range, visit the Pomegranate Fizz Sticks or Citrus Fizz Sticks product pages.